The tools are all counting on Nevil the Level to win this year’s soapbox derby. Nevil thinks the only way he can win is by cheating, and Mini-screwdriver tells him how. As the pressure mounts, what will happen to Nevil’s motto, “Straight and True”? 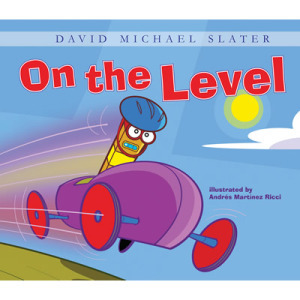 On the Level is one of the books by David Michael Slater that features favorite tool characters, such as Nevil Level, Mini Screwdriver, Don Hoe, Henry Sprinkler, and more. In this book, Nevil Level is preparing for a soapbox race, keeping his car “straight and true.” The tools have never won a race before, and Nevil’s poor performance makes it seem that they never will. The other tools are mean and stomp off in a huff, complaining about Nevil. Only Mini Screwdriver has faith in Nevil’s level abilities. Mini gives Nevil the gift of a black box, in which she says there is a powerful magnet that will draw him to the finish line where the other tools will be waiting. Throughout the race, any time that Nevil thinks he is failing, he thinks of that powerful magnet in the black box in his car and is able to keep on moving forward. When he wins by a landslide, the Hammer Slammer and the Driller Thriller accuse him of cheating. In the next race, Nevil again focuses on his powerful magnet drawing him to the finish line as he races the Flame Thrower. Again, he is accused of not being on the level with his racing ability. He decides to confess, and pulls out the black box, only to find that it looks empty. He realizes that he won because he was being carried by the faith of a friend. And he inspires the other tools to carry their “empty extra parts” filled with faith to lead them through their races. It’s an inspirational story that reminds children that if they believe in themselves, they can accomplish anything. It also tells them to show their faith in their friends to help their friends accomplish their goals, as well. Characters in the book, though they are tools, can appeal to girls as well as boys. The puns on their names make for great groaners that can keep parents and teachers entertained as they read the book out loud. The idioms contained within are defined at the end of the book and lead to great lessons on the English language. Illustrations by Andres Martinez Ricci will also appeal to children, as their style mimics kids’ favorite cartoons on Cartoon Network, brightly colored and cartoony expressions.